This blog has moved – read the full post HERE. What a year so far! Lots of great Unity3D and jibe projects, a pair of OpenSim builds, and even some Unreal and Web Alive work. This year has been all about platform diversification, and some of the biggest and technologically innovative builds I’ve had the pleasure of working on. “More recently, the authors of this paper worked with a Fortune 500 firm to design, prototype and model both the look and feel of the firm’s physical retail spaces and the experiences the firm wanted customers to have in retail establishments. 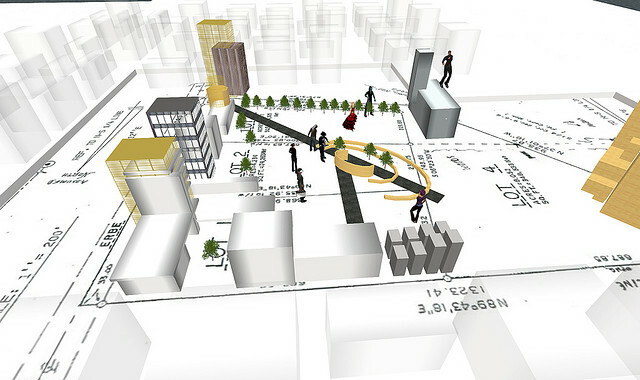 To accomplish this task we immersed the team – clients and consultants – in Second Life, building new retail establishments and interacting with those retail spaces using avatars. We believed thatworking as avatars in an infinitely malleable 3D environment would not only spark their creativity and encourage experimentation, but be quicker and more cost effective than trying to do the same work in a sterile conference room. “As we developed the retail spaces, their avatars moved through the spaces, recommending changes and generating ideas on the fly in a setting where rapid prototyping was exceptionally simple. “Virtual worlds allow rapid, iterative prototyping in three dimensions with little cost. Architects, for example, can quickly and easily create mini or even full-scale models of homes to show to their clients. Likewise, it is quick and easy to make adjustments based on client feedback in real time as it is given. This kind of iterative prototyping not only speeds up the development process, but encourages idea generation and out-of-the-box thinking as well. Rapid, iterative prototyping is so natural in these spaces that you’d think the virtual worlds were designed for this purpose alone” (bold emphasis mine). There were more than 42,000 kilometers separating this group if you connected our locations around the globe. For Amr Attia, in Cairo, Egypt, it was 10:00 in the evening. For Judy Cockeram, it was just 9:00 in the morning – but it was the next day for her, half-way around the world, in Auckland, New Zealand. Together with Moira Hunter (Paris, France), Bernd Boetzel (Berlin, Germany), Brad Kligerman (Cambridge, Massachussets) David Denton (Knoxville, USA), Scott Chase (Aalborg, Denmark) and myself (Madison, USA), this group joined together in the same time and place on Architecture Island in Second Life to have one of the most interesting and inspiring conversations I’ve witnessed in a long time. I may never cease to be amazed by this global network, and the virtual fabric we use to stitch it all together. The creative and potential energy in this space was incredible, and I was honored to be a part of it. 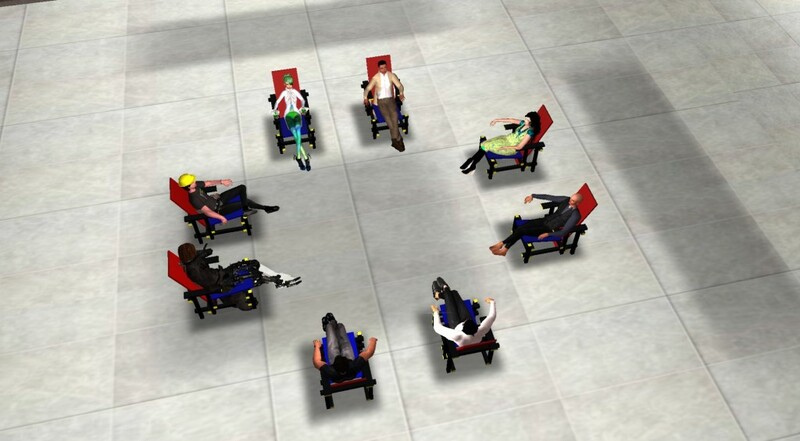 Each of these participants has completed and promoted specific initiatives and projects aimed at increasing awareness and raising the bar for architectural uses of virtual worlds, and it was very exciting to see this group gathered together in the same time and place. We’re definitely looking forward to many more discussions, with wider participation, in the future! From my studio in Madison, Wisconsin, USA, I’m listening to 3 architecture students in Paris, France presenting design concepts they developed during a week-long ‘intensive’ design studio at Paris-Malaquais using the virtual world Second Life, and I feel as though I’m participating in architecture’s best kept secret. I’m joined by dozens of others logged in from every corner of the world as part of this <a href=”http://www.vwbpe.org/&#8221; target=”_blank”>VWBPE Conference</a> session by the newly founded European initiative ‘ARCHI21,’ and can think of no other medium, method or technology that could bridge our worlds as effectively. As I listened carefully to their fascinating presentations, I was totally immersed and engaged, and if the quantity and thoughtfulness of the back-channel chat was any indication, the others in attendance were equally impressed. I was in awe at the quality and theoretical sophistication of their work, and the deep thinking they had put into these projects in such a short space of time. 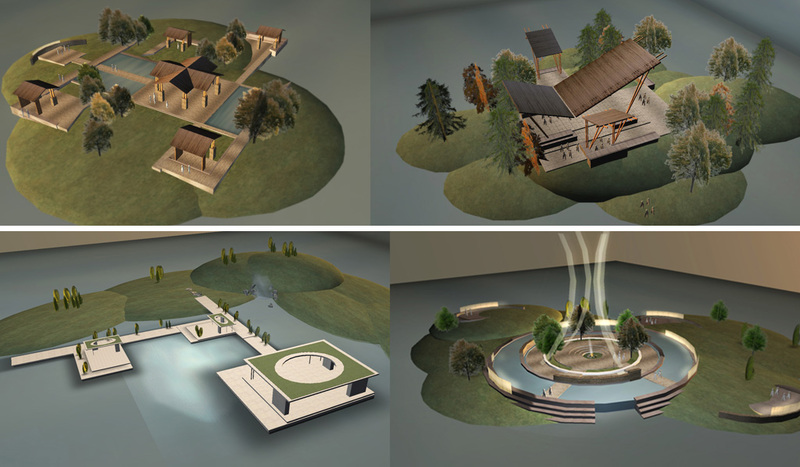 Having spent the past several years exploring virtual architecture, I was challenged and even a little intimidated by what these students were able to come up with in just one week. My only criticism might be that I think they seem to have underestimated the utility of common ‘real world’ visual cues and practical function of virtual spaces – instead prioritizing pure philosophical and theoretical exploration. I think it’s possible to achieve a balance between conceptual thinking with the more pragmatic concerns of potential end-users of these spaces – blending form and function into a seamless composition, rather than favoring one over the other. 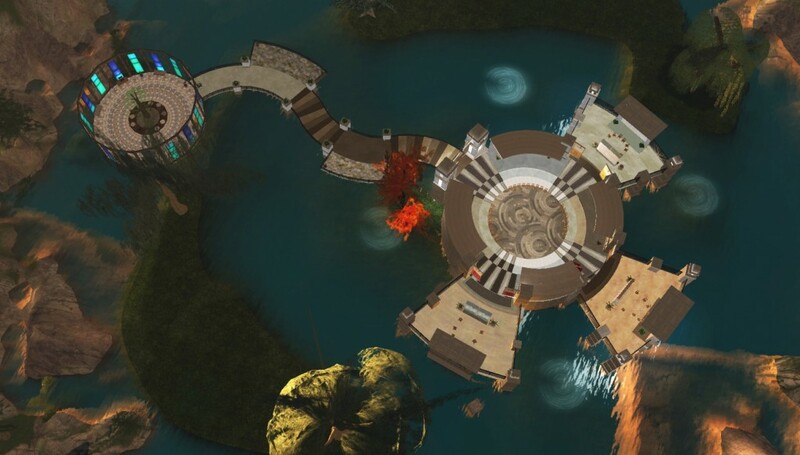 However, they may have explored this more than I am aware, and since this was their first exposure to Second Life, with only had a single week’s development time, I can hardly fault them for not exploring every possible angle. 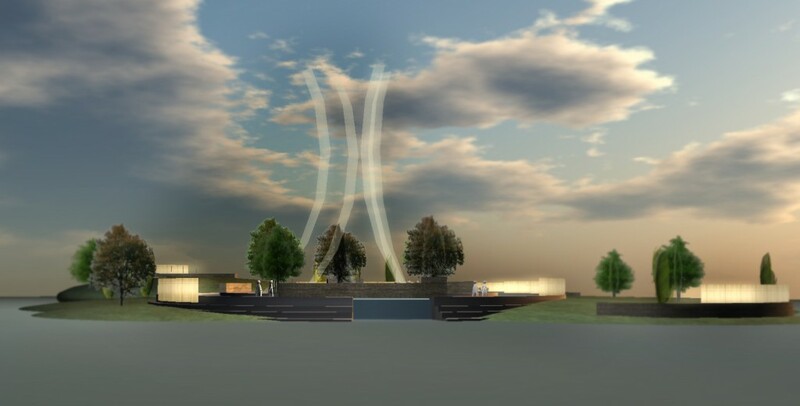 I am honored to be a part of this fascinating project as an associate partner as ARCH Virtual, and will be sharing much more of their work as it is made public. Congratulations and thanks to these 3 students for sharing their work! As information-based virtual collaboration gradually turns the corner to mainstream adoption, it won’t be long until the benefits of 3D collaboration are as unequivocally proven (if they haven’t already), and virtual worlds like Second Life and OpenSim will soon prove to be an ideal modality for gathering a virtual team together to collaborate within a realtime, 3D collaborative environment. If there was ever any doubt that virtual worlds have a place in architectural practice and education, this month’s special issue of ITcon presents a staggering amount of content that is sure to help promote the use of virtual worlds and game engines within AEC industries and beyond. The Journal of Information Technology in Construction (ITcon) is a peer-reviewed scholarly publication recently published a special issue dedicated to the use of virtual world technology in architecture, civil engineering and facility management. The papers are all free to review, published with open access distributed under creative commons license, so be sure to check out this incredible resource. 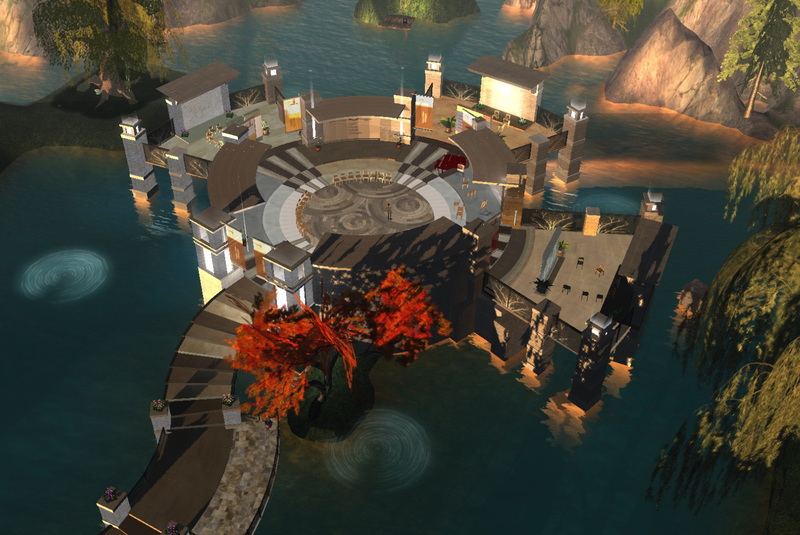 If only I had a Linden for every time a client asked for a meeting space or auditorium in their new sim… The grid is saturated with auditoriums, and these vast, elaborate and often prim-intensive spaces could almost always be put to better use. So when the ‘cats’ (founders of Startled Cat) originally described their need for a conversation space, I quietly took notes, listening carefully as they articulated their needs – waiting for a pause in the conversation to push back a little. But as they described the project in greater detail, I realized this one was different. This space would soon be hosting some of the deepest and potentially life-changing conversations on the grid, and the architecture of this space would need to play an integral role in organizing, nurturing and encouraging a variety of emotionally powerful experiences. The space would be used by Intersections International to host a Second Life version of their Veteran-Civilian Dialogues (VCD), which brings together veterans and civilians in facilitated conversations around the impact of war upon both groups. The dialogues are designed to help bridge the gap to civilian life for returning soldiers, and have proven to be life altering for those who attend. I had just attended a presentation by the Dalai Lama here in Madison, which was hosted by The Center for Investigating Healthy Minds. Part of the discussion, and one of the recent interests of the Center itself as it completed a new research space, involved the role and science of architecture in shaping experience, so I was especially excited to explore ways in which some of these principles might also apply to virtual modalities. This project would be a perfect place to start. 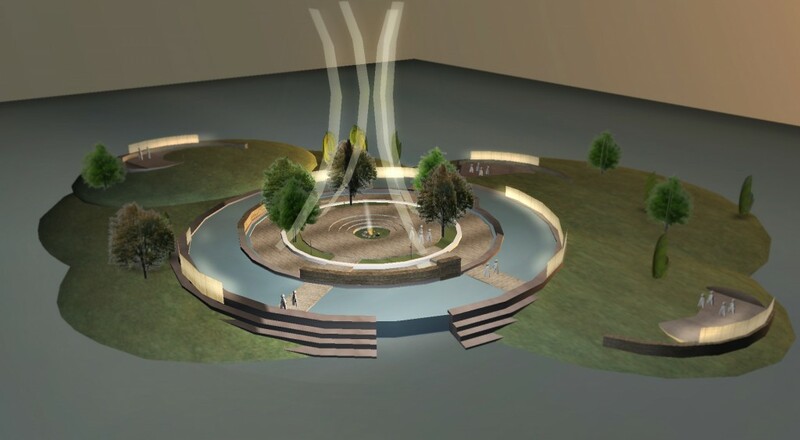 The initial design briefing called for a central gathering space, with smaller break-out spaces surrounding it, and the first round of design concepts proposed a wide variety of styles and configurations in mini-model format. I often find it beneficial to propose even the most far-fetched concepts, which can sometimes lead to surprising or unexpected directions (some of the really ‘out there’ concepts aren’t shown here). In this case, the team unanimously gravitated toward the circular scheme – feeling that it was probably the most apt metaphor, concentrating the energy toward a central space with translucent spires ascending above it. During our initial design reviews with the client and end-users of the space, a fascinating and somewhat surprising bit of feedback was brought up. It was suggested that many veterans prefer secure spaces, and the openness of this design might actually be quite unsettling and uncomfortable for them. One example someone shared was the fact that many veterans prefer to sit with their backs to the wall so they can more easily survey their environment. While it might be easy to dismiss the idea that such a strong physical reaction to architectural space might also apply in a virtual environment, it has long been known that people really do experience a strong connection, or sense of ’embodiment’ in their avatar to a certain extent. One example often cited is the fact that if a virtual object is thrown at your avatar, many people will physically flinch in the real world – even though the virtual object could obviously do them no harm. 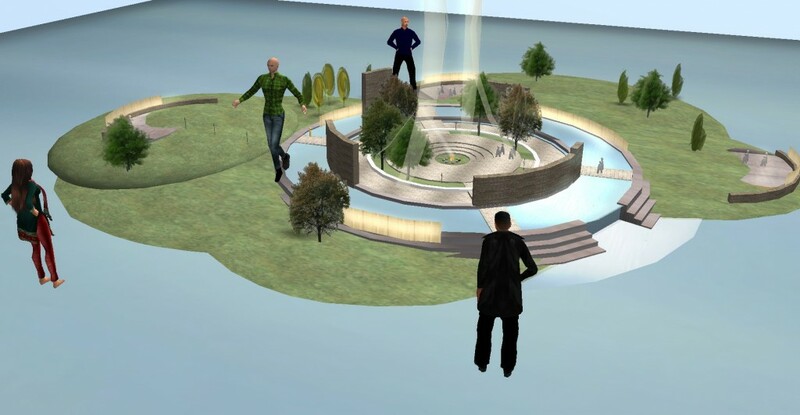 This mind-avatar connection is precisely what gives the virtual experience a significant advantage over other online meeting tools and social media, by providing a strong sense of presence and immersion within a space. 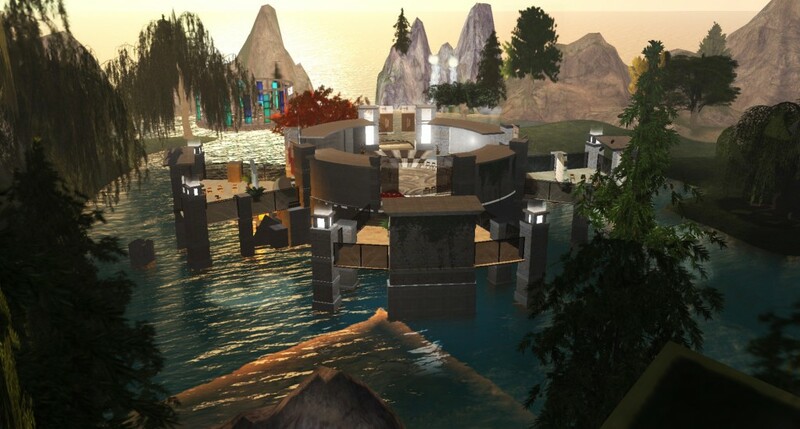 This is exactly why a VCD in Second Life could become a truly meaningful experience to those who participate – the virtual world captures the sense of community and togetherness within a space that no other online medium could come close to replicating. As developers working with virtual worlds, we’re constantly touting the importance of the design and architecture of virtual spaces, and how it can be used to shape and encourage meaningful experiences and achieving functional goals. Yet, in this case, I had completely underestimated just how important the virtual space could really be, and with their feedback in mind, we re-examined the design concepts. We revised and modified the design to make it feel more secure by enclosing some spaces, first by raising concrete walls around the outer circle but we soon realized that we had actually gone too far and had created an environment that was too confining and enclosed – to the extent that it could actually make the civilians participating in the dialogue uncomfortable. We continued to fine-tune the design until we arrived at a concept that seemed to work well, then started massing it out at full scale. As the space took shape, the clients and end-users visited and provided feedback along the way. At times, we were able to transform the space on-the-fly to test various ideas as we brainstormed together. It was an incredible experience to be able to literally prototype the client’s ideas at the very moment they were describing it – translating ideas into form in realtime. This is one of the most potent advantages of the virtual design process that trumps traditional architectural design development, but I digress. One of the VCD facilitators mentioned the importance of orchestrating procession, where participants would walk together on a path leading to the conversation space, and how important this can be for framing and setting the stage for the dialogue. As he spoke, we opened one of the sides of the central space and prototyped a meandering pathway and walked along it together to try it out. With some additional tweaks, we had the processional pathway complete. As brainstorming continued, Jenaia Morane (one of the ‘cats’), wondered what it would be like if we elevated the entire conversation space so that it would look out over the water. Within seconds we tested the idea, and immediately agreed that it worked really well and also enabled us to frame views of the surrounding landscape. The processional path now ascended to the central space, giving it a sense of hierarchy and subtle grandeur. Jenaia and the rest of the team at Startled Cat polished up, landscaped, textured and detailed the build in time for the first Veteran-Civilian Dialogue. 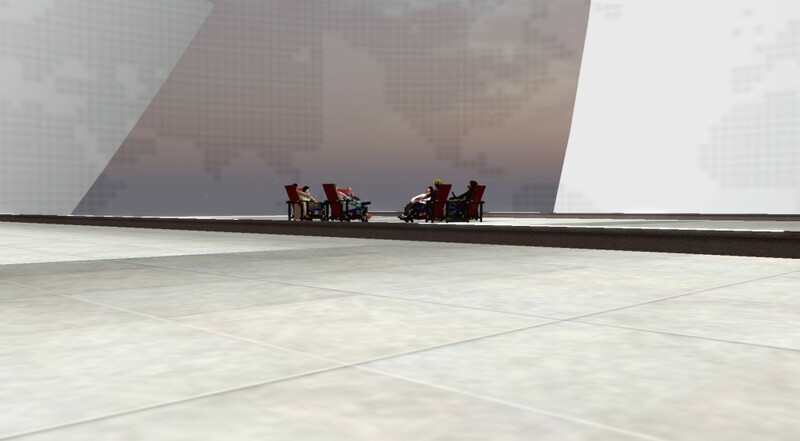 The event was captured incredibly well in the following machinima, including the procession to the conversation space, and the role of the virtual architecture in helping to choreograph and reinforce that experience. 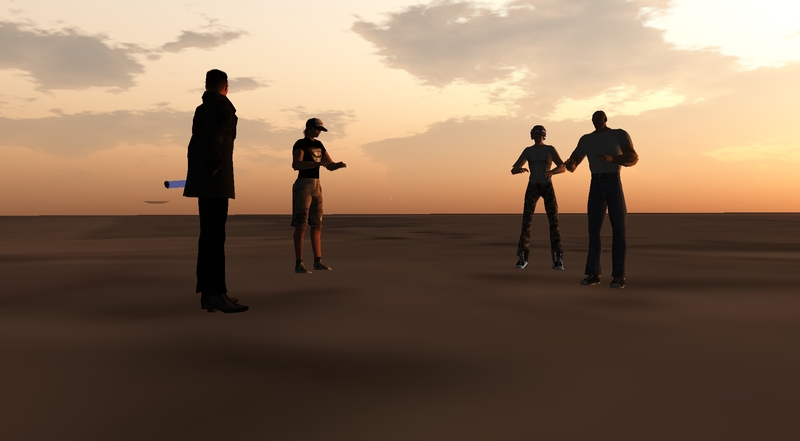 The Second Life version of the Veteran-Civilian Dialogue was mentioned in this New York Times article, which also describes the VCD experience. I think this photo, featured later the same week in the New York Times ‘Week in Pictures’ captures the spirit of the VCD quite well. To learn more about the project, check out this Monday’s Metanomics broadcast, where host Dusan Writer welcomes Intersections International to Metanomics for a discussion of virtual dialogues, spirituality and human connection in the ‘age of the machine’.